Anh Ngoc Tran began his formal training at the Hue College of Arts, Vietnam, where in 1993 he received his BFA with honors for his research of the sculptural practices of the Cotu tribe. Since then, he has gone on to receive additional degrees in the fields of science, philosophy, and teaching. In 2010, Anh Ngoc relocated to Texas, where he received his Master of Fine Art in Sculpture from Texas A&M University, Commerce in 2012.
the high mountain region near the Laotian-Vietnamese border. Arts in Thailand, Lao and China. Fine Arts Thailand and Viet Nam. Thailand, Biennale, Hue City and Hanoi Capital, ChiangMai-BangKok-ThaiLand. : Arts Exhibition by the Staff of Hue University of Arts and Faculty. 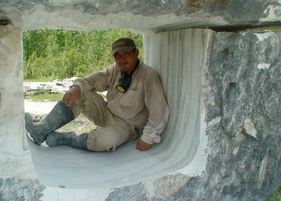 2005: The first International Stone Sculpture workshop in Nha Trang bay, Vietnam. 2003: International Arts workshop in Lijiang old City in China. 2003: International Burragorang workshop in NSW Australia. 2002: Working as staff in the third International Symposium Sculpture in Hue Vietnam. 1998: The second International Sculpture workshop in Hue, Vietnam. Vietnam Fine Arts Association, young artists.